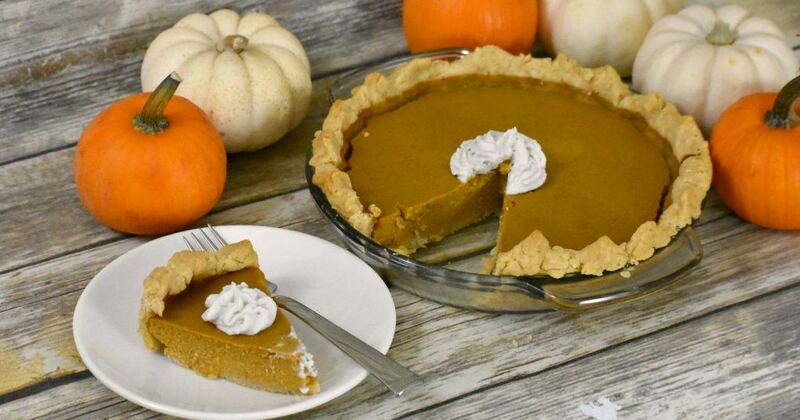 Thanksgiving and pumpkin pie are two things that just go together. They always have and always will. 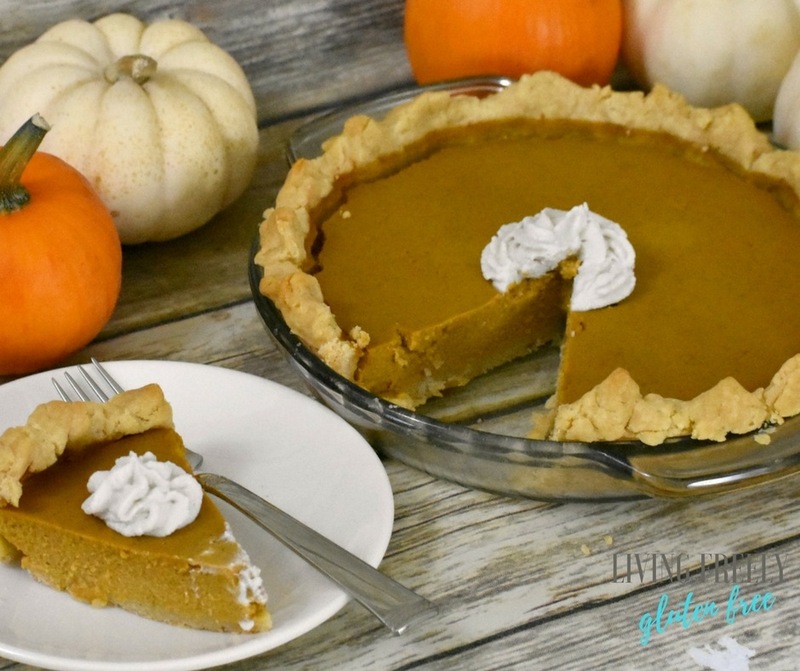 Creating a gluten free and dairy free pumpkin pie took me a little time, but the challenge was truly in the crust. This post contains affiliate links. Living Freely Gluten Free makes a small percentage of ant purchases made through these links. This income helps to cover the cost of running this website and bringing you delicious recipes. Thank you for your support. After I finally figured the crust out I could concentrate on the filling. The first pie on the agenda was pumpkin. 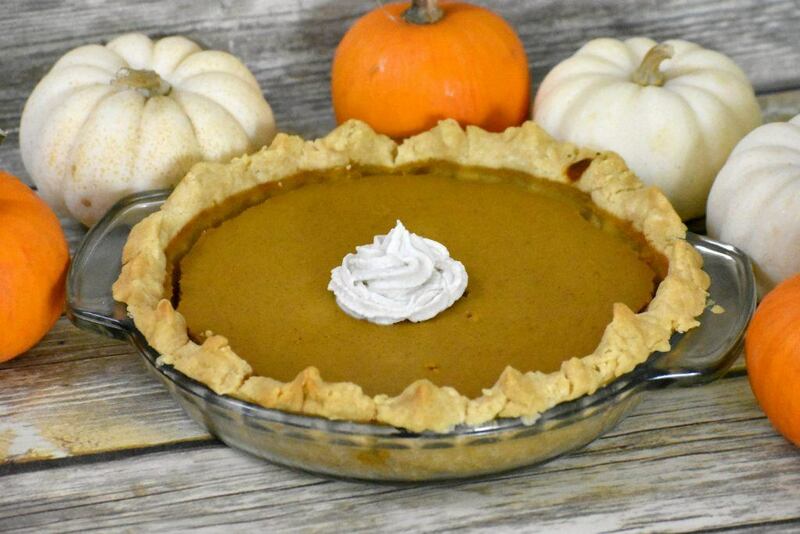 Thanksgiving is right around the corner and of course when I asked my husband and son what pie they would want for thanksgiving this year- pecan or pumpkin, pumpkin was the winner. Sorry pecan pie lovers, that one will have to wait for next year. Obviously you can’t have pumpkin pie without whipped cream. I haven’t found a dairy free whipped cream in any of my stores, so my homemade coconut whipped cream recipe will be the perfect topping for it! I highly recommend using a full fat can of coconut milk or coconut cream in this recipe. The So Delicious Culinary Coconut Milk is also a great option. I have used it and it works perfect. I have only attempted this recipe with full fat coconut milk. The simplicity of pumpkin pie is what keeps me coming back to this recipe, it really only takes a few minutes to whip it together. I have made it in my stand mixer and I have used a hand mixer as well, both with great results. When I made this in mini pie form to test it out, I was happy that they came out great as well. Obviously they don’t need to cook as long. I forgot to track the cooking time, but I would suggest cutting the time in half (per recipe) and then taking it out when a toothpick comes out clean. There have been no issues with the crust over cooking on the top (this had been an issue with me in the past) and I think that is because I am not pre-cooking the crust at all. 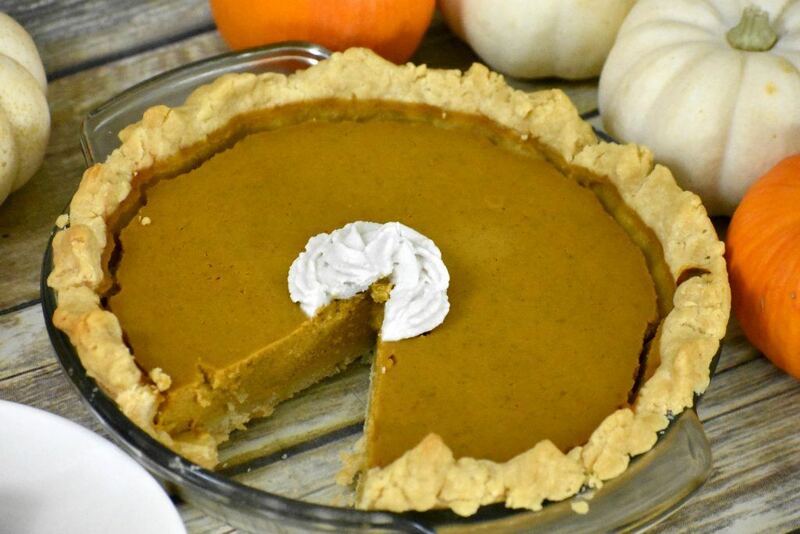 I pour the pumpkin pie batter in the raw crust shell and then allow it to all cook together. If your crust ever starts to darken too fast you can wrap some foil around it (just the crust edge). I have also seen a new kitchen gadget called a Pie Crust Shield that does the same thing. Living so far away from family, the holidays haven’t been the same. I have been working really hard to get my first order of books sold. Self publishing is expensive and scary, but its been amazing and so much fun all at the same time! I am heading to San Mateo, CA next weekend to sell my book at the Gluten Free and Allergen Friendly Expo and then we will be celebrating Thanksgiving with our families. I miss them terribly and I can’t believe how fast this year has gone by, what a whirlwind! What will you be doing for Thanksgiving and what is your favorite family dish? 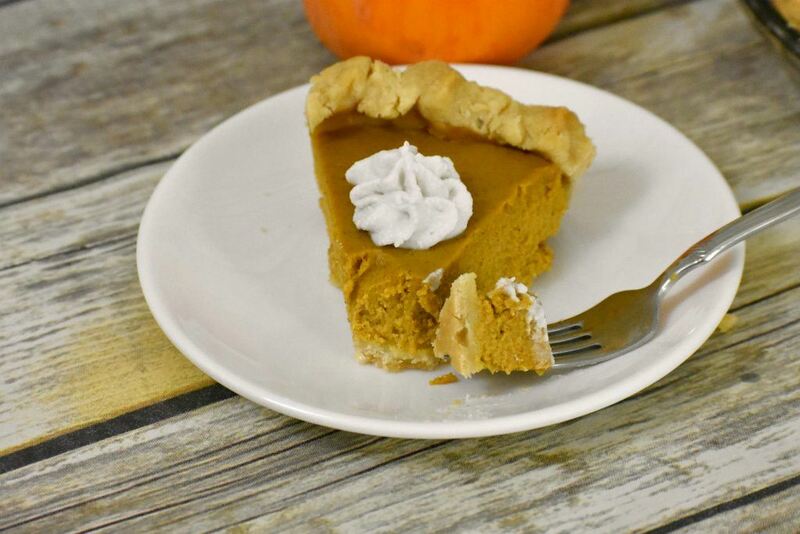 This delicious Pumpkin Pie tastes so good no one will know its is gluten and dairy free. In a large bowl add all of the ingredients and beat with a stand mixer or hand mixer until it is creamy and smooth. Pour into pie shell and bake at 425 for 15 minutes. Reduce heat to 350 and cook for an additional hour, or until a toothpick comes out of the center clean. Allow to cool for 2 hours before refrigerating. Serve with coconut whipped cream. Store in the fridge. Enjoy! If you like this recipe you will love my cookbook with over 100 gluten and dairy free recipes that are delicious, simple to make all with easy to find ingredients. You can purchase it on amazon or my online store. 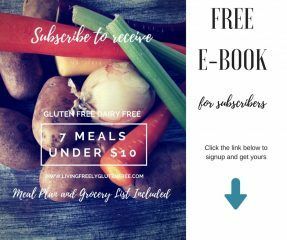 E-book- Living Freely Gluten Free: Over 100 gluten free and dairy free recipes that are simple to make with easy to find ingredients. this is so good for thanksgiving and christmas!!! me and my family love it !! Do you think this will work with an egg substitute like a flax egg or bobs red milk egg replacer? I did originally try to create this vegan and I could not get it to turn out. I’m not confident that that egg replacer will work in this recipe. Sorry! My 1st attempt at making pies in my life. They turned out awesome. We made one for the pie tasting at my son’s school and one for the pie social at church. Everyone loved it!! Most importantly, my son loved it!! He had some left over and had it on Thanksgiving day. I will never be afraid to make pie from scratch again. Thanks for the great recipe. This made my day! I am so happy that you were able to easily make a pie for everyone to enjoy!